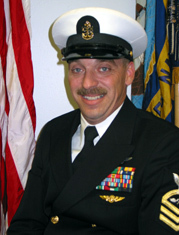 AWC (AW/NAC) Chad Michael Smith served in the Navy from April 1987 to April 2007. Deployed to the Arabian Gulf in support of Operation Desert Shield/Desert Storm. While onboard USS Tripoli, the ship struck a floating Iraqi mine earning him a Combat Action Ribbon. February 1999 – Deployed onboard USS Inchon in support of Operation Shining Hope and Operation Noble Anvil. August 1999 – Assigned to Panama City, FL where he worked intensely with the Airborne Mine Neutralization System which culminated in him being the first Aircrewman to successfully detonate a live mine utilizing the system. February 2003 to June 2003 – Deployed to Bahrain in support of the Global War on Terrorism and Operation Iraqi Freedom. Played a key role in establishing a permanent detachment, bringing a Heavy-lift and Airborne Mine Countermeasures capability to the Northern Arabian Gulf. Upon completion of this tour, he reported to HM-18 for duty as Command Chief. Personal decorations include the Navy and Marine Corps Commendation Medal (2 awards), Navy and Marine Corps Achievement Medal (4 awards), the Combat Action Ribbon, and various service and campaign awards.